Kathleen Millard, general manager of Elm Street Books, has been managing the store for ten years. NEW CANAAN—Among the quaint shops and restaurants of Elm Street sits Elm Street Books, New Canaan’s only independent bookstore. In the window are beach bags and books to pack in them, from colorful children’s books to adult summer reads. Inside, readers browse among the dark wooden shelves, often decorated with kid-friendly stuffed animals, posters, and more book displays. Even the bathroom is plastered with posters for popular books. In the back room of the store sits Elm Street Book’s general manager, Kathleen Millard. Unlike many stores, there’s no door blocking off her office from the sales floor. Customers could easily wander back to ask for a book recommendation—and there’s nothing she’d like more or be more prepared to do. Millard has been working in bookstores for over a decade, but her love of literature predates that, going back to when she went to college as an English major. 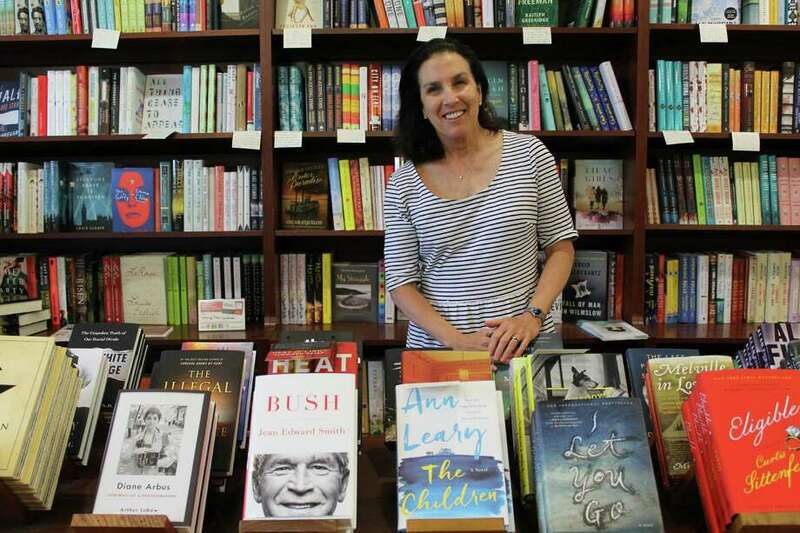 The New Canaan News recently sat down with Millard to talk books, setting up author events and what it takes to run an independent bookstore in the era of the e-book. KM: The day-to-day involves a lot of email, because I book events and they take a lot of communication to get the dates, locations and times. We work into the future, so we’re working on winter events now. Plus, I order all the books. I order what they call the front list, which are the books as they come out. I do all the social media, so I’m on Twitter and Facebook. I have a blog, and I have e-blasts that I send out to notify customers of what’s going on. We have Pinterest, which is kind of fun. And I do schedules and the human resources of the store. The book-selling staff primarily services customers in the front of the store and shelves books. Then we have a children’s manager who really leads the charge in that department. She does similar things as I do. She orders children’s books, she comes up with promotions. We also have a person who helps us with displays. If it’s January, we do a “Let’s get healthy, drop five pounds” presentation and we put diet books with tape measures or whatever you have to sell in that category. There’s a lot of interaction between staff and myself to try to create a dynamic and fun environment for the customers. You have to change it. You want them to be interested in it and it has to be current, because books are coming out all the time. I have a lot of hats that I wear. Q: What makes this job different from a regular retail position? KM: Bookstores are a little different. We don’t just sell a product, we sell ideas. I think when people come to a bookstore, they don’t come here just for an item. They come for suggestions. People can come in looking for the bestseller that they saw in the New York Times Sunday magazine and they go out with a book on personal growth or World War I. It expands you when you come to a bookstore. That’s why people meander. They stay and they sit in chairs, kids roll on the floor and read books. Quite often on a Saturday morning, we’ll have families just sitting, reading books in the children’s department. We don’t clap our hands and say “Okay, it’s time for you to go!” Everybody just sits there, where in another retail setting, you wouldn’t try on clothes, rolling on the floor, and try on more clothes. You would be scooted out at a certain point. So that’s the luxury of a bookstore. And people tell you things in a bookstore. We’re like little psychiatrists. People come in and you start telling them about a book and it triggers some idea of something that happened to them or some career they experienced and you have conversations on a very personal level that I don’t think you have in most retail stores. It’s how we get to know our customers and how we get to deliver the right book into their hands. Q: What do you do to entice people to come here over a chain store? KM: I think the most important way we bring customers in is by delivering really good customer service. All the staff reads, so they know the books. We don’t want to just sell you what I sold Joe down the street. You each have your own particular genres that you’re interested in and we really want to sell what you like. So it’s talking to customers, and by talking to customers, you really get to know your customers. We know people’s names; we know how many children they have; we know who had a graduation; we know when Grandma’s coming. There’s a lot of personal information that’s exchanged in a bookstore and it helps us to give our customers the best service we can provide. Plus, there’s a community. They’re not just a customer that walks in and we never see them again, which is really nice. That’s what a small bookstore should do best. Q: How do you pick what authors come to the store? KM: It starts out with the publishers. They define who’s going on tour. Then they send me a list of who’s going out and where they’re touring. If they’re in my vicinity—we usually fall into the New York metropolitan vicinity because we’re fifteen minutes outside—I can request them with a proposal that would entail where I want to do it, if I want to do an interview, a straight book signing, or a talk, what type of audience I can garner, and what number of books I can sell. They want to know that you understand how to market the person. They don’t want only three people showing up. It’s very competitive, because authors have become celebrities. When we first started, we didn’t have as many people chasing authors as we do now, so you have to do a lot of proposals to get what you want. KM: It changes all the time. If I went to the classics, I would pick things like “House of Mirth,” “My Antonia” and “Old Man and the Sea.” “The Nest” is a super book for the summer, kind of a mix between Tom Wolfe and John Irving. There’s something coming out by Ann Patchett called “Commonwealth,” which is a terrific book about what it means to be family and it’s a contemporary story of a blended family. “All the Light We Cannot See” was a super book. “The Nightingale was a super book.” “The Goldfinch” was a great book. It’s like a candy store, you can’t pick one. They’re all so good.